Directions : Study the following pie chart and bar chart carefully and answer the questions given beside. A person covers a total distance of 3000 km in 6 days, by bus, by Ola, and by Uber. Study the pie chart and bar graph to answer these questions. The percentage of total distance travelled in 6 different days. 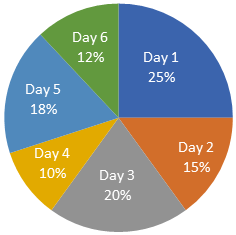 The percentage of distance covered by each mode on each day. What is the total distance covered by Bus? 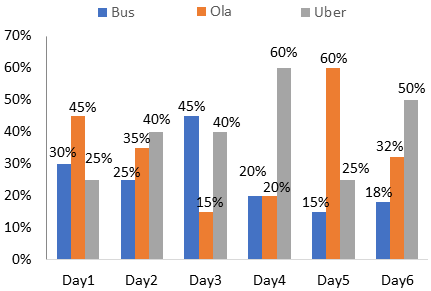 Find the respective ratio of the distance travelled by Bus, Ola, and Uber.